I am sorry I wasn't able to post on Sunday night. 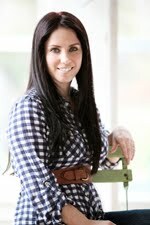 I first wanted to thank Shannon, a writer for HGTV.COM for featuring my bedroom on their site. Be sure and check out Donna's headboards she created while you are over there too, Donna is so creative and talented! I wanted to share a few pictures of our Christmas table setting. I actually had planned to do something else, but it didn't work. I first tried to put magnolia branches down the center of the table. I lined up five french canning jars down the middle of the table. This is a very sparse bouquet... but it was all I had. I only had a little bit of baby's breath and two different types of hydrangea blooms. 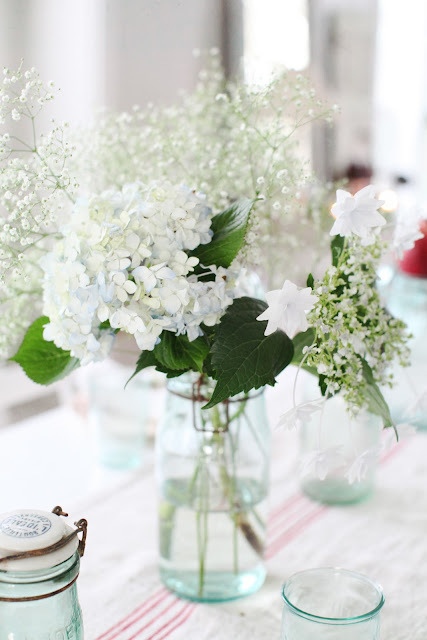 I tied twine around the napkins and added a sprig of boxwood and a paper white bloom. I did this a couple of years ago for our Christmas Dinner. I got out my favorite antique red and white dishes from France. I used my red striped grain sack runner, that my mom made. I recently found two french canning jars with the porcelain tops. We have been fortunate enough to be able to spend some time with our families this week. P.S. There is still time to enter the City Cottage Giveaway! dear Maria also my table was very simple and pure but ...But the simplicity is the essence of the true magnitude! Simplistically beautiful, just like everything you do. The glow from the aqua jars is so lovely with all your daylight streaming in. Lovely photo shoot! Oh Maria..how gorgeous! 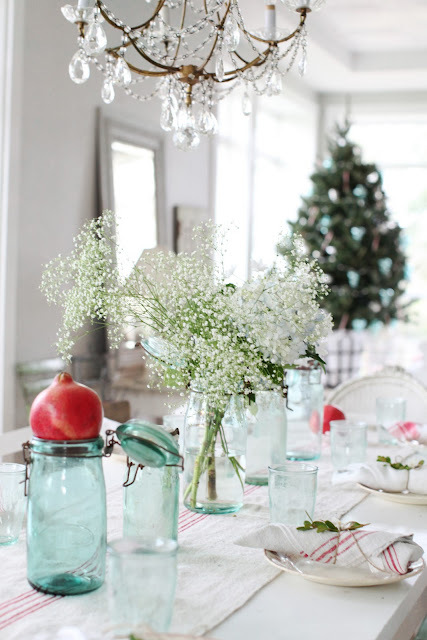 Loved the pomegranates against the blue of the jars...and the hydrangea with the babys breath..so sweetly simple..AND the table runner (now that's inspired me to sew!)..beautiful! so cute, simple and natural! I love your blog sooooooooooo much..
Carissima Maria, è mio desiderio ringraziarti per questi mesi ricchi di immagini e parole meravigliose.Possa essere il nuovo anno ricco di amore e serenità per te e la tua dolcissima famiglia!!! Simple but really beautiful. Love it! Il est toujours bon de jouer la carte de la simplicité... Le résultat fut réussi n'est-ce pas? And I envie you for your lightness in your home. Since days theres no sun on our sky, all is grey and dark. best regards and a good start into 2011..
i hope you are enjoying your holidays. your table setting looks beautiful. love the skinny little mason jars. so different. i will need to keep my eye open for those. have a great day maria. Simple and elegant, Maria. Those French canning jars are lovely! Happy New Year to you and your beautiful family. So simple and elegant. A pretty place to visit with family. Your photos are really beautiful! I agree, it is stunning! So simple yet sooo beautiful!! Love the touches of red dishes from France, lovely!!! 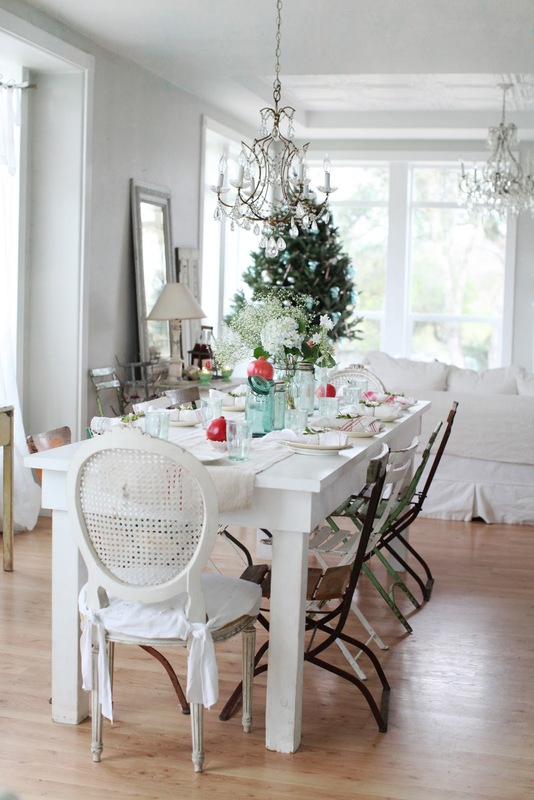 A very lovely tablescape! Hope u are doing well and have a great New Year! Not a fan of baby's breath either. So old school. 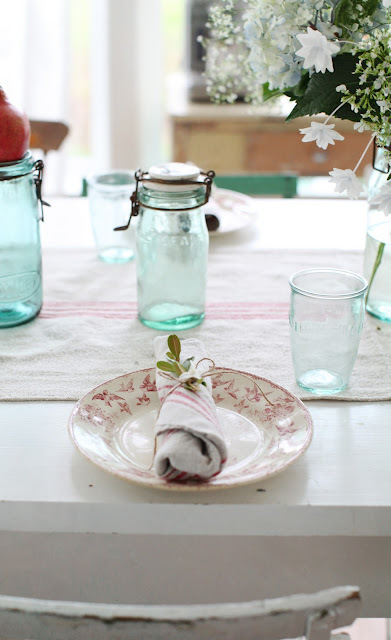 Love the canning jars, dishes and the wrapped napkins with boxwood. The pomegranites were the perfect red for your table. You are such a genuis when it comes to design. Can't wait till your online store opens up. Happy New Years to you and your family. Just found you!!!! I'm in love!!! That baby's breath is beautiful!!! reminds me of snow. Your decorations are always so nice!! 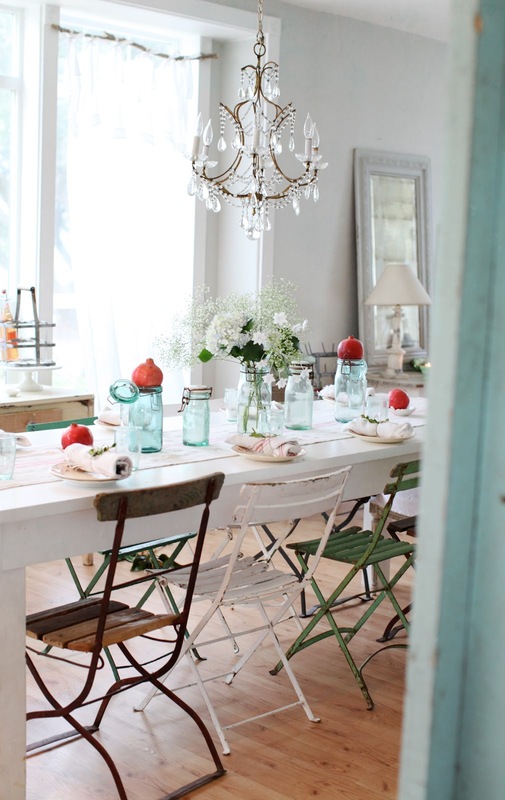 Maria, your home is simple elegance..love your style..such an inspiration...I love your french canning jars...mmmm ..yummy. I am a big fan of baby's breath and I used to put it on my christmas tree, I forgot to do that this year...thanks for the reminder. 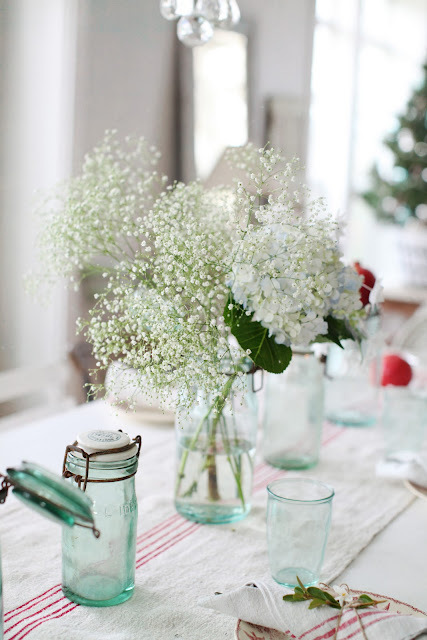 So funny - I tried branches down the center of the table - coudn't get it right so I jammed them in a blue jar and added some baby's breath in white Oil & Vinegar bottles. 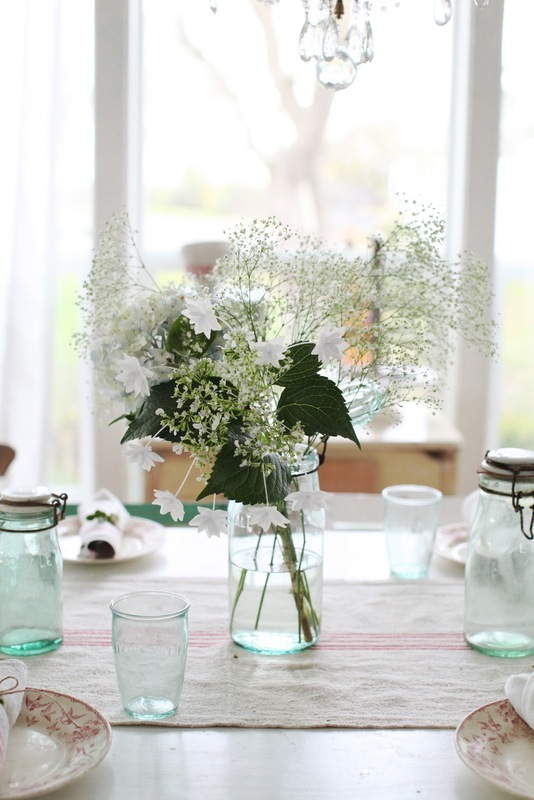 Was not a fan of baby's breath before, but they are white, natural, wild and free - I love that. Dear Maria, your table setting is so beautiful! I love every detail! Especially the white flowers! I love your photos too!!! understated perfection - your specialty! i am soooo buying some blue canning jars for when i finally paint my armoire. Simple and pretty. Boxwood and baby's breath...just perfect! 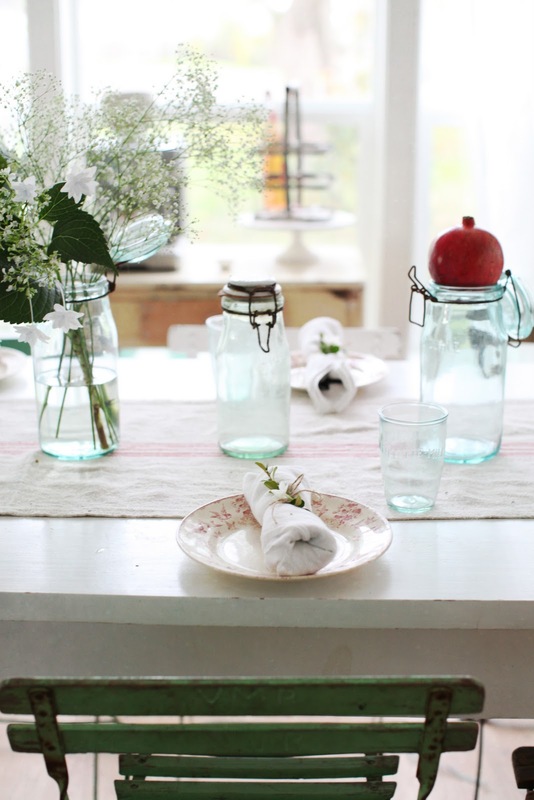 SO So beautiful, love those canning jars with the porcelain tops. Your simple styling is just perfection. Love your red and white plates. Beautiful!! What a blessing to your family. Love it. The jars, the dishes, the pomegranates, the runner. Simply beautiful! Just Beautiful, Can absalutely see why and how your amzing design was featured..
Love IT all. Just Beautiful.. I'll be right back..........going to home depot for white paint!!! Dawn Suitcase Vignettes..drop in sometime!! Love your style!!! 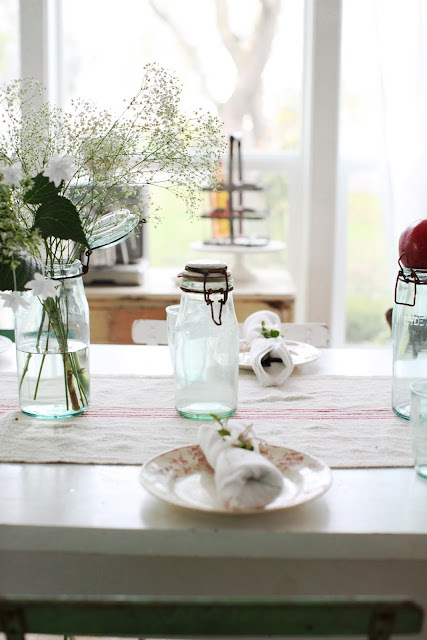 Love your simple table and I'm with you on the canning jars w/porcelain lids, they're an item of beauty for sure. Have fun w/your family, that's pretty much what we're doing here too this week. 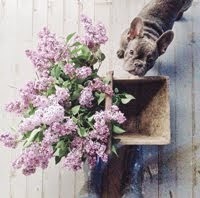 Hope to see you at the flea once weather gets a bit better here. Enjoy, sweetie! How beautiful! Love it all. Very elegant and simple. love the table setting so simple so beautiful. I think the table looks so pretty. I really like the table runner. Fabulous and simple! I love it! gorgeous! i would love to have this waiting for me on Mondays when i get back from work! just stumbled upon your blog and i have to say i LOVE it. do drop by mine to when you get a chance. perhaps we can follow each other. Hello Maria ~ what a lovely table you set! My bedroom tree has been put away so my lovely table runner is making it's way to my kitchen table! Wishing you much happiness in 2011!! How lovely, so clean and fresh...great way to welcome in the New Year. 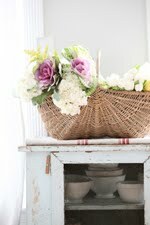 I covet the porcelain topped jars, they would look great atop my grainsack runner too! Divine! WOW, Love that, so simple, yet so pretty! A very happy new year for you and all your family ! Maria your table looks amazing as usual! you're really a excellent webmaster. The website loading speed is amazing. It kind of feels that you're doing any distinctive trick. In addition, The contents are masterpiece. you have done a magnificent activity on this subject! I love those flowers. I blogged about them and your shop, hope you don't mind! Hi Maria! I know this is an old post, but I love these napkins rolled on your table! And I have to ask, did you make them? Are they grainsack? I would love to find some like this! Thanks so very much again! You are such an inspiration!